A bar to call my own | Optimism and Co.
For a while, I have been wondering about the kind of top to install on the bar ledge dividing the kitchen and living space in my home. The industrial-style bar counter works as a room divider – there is an insanely tall black steel framed glass four-panel folding window hung above it that folds back to open up the living space or section off the kitchen to dramatic effect. The bar itself is wrapped in a lacquered black steel that will hopefully weather well and develop a lovely rustic patina. My original choice was a long beam of live-edge, honey-hued teak wood to contrast with the cold hard black steel. But after thinking about it for a while, it occurred to me that there was a risk of the final effect looking contrived. 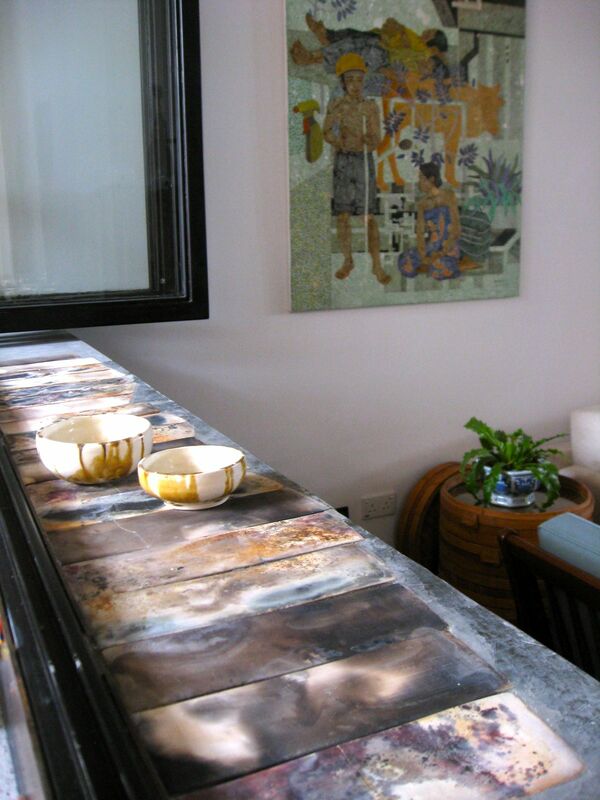 My ‘aha’ moment was to make my own wood-fired ceramic tiles. These were designed to be laid out in the middle of the bar top and to have an uneven slanted edge to add interest. The tiles were fired with dustings of copper oxide and iron oxide that mingled gorgeous red, copper and indigo tones with the smoke trails of the wood fire. I had the contractor cast the concrete block and I laid the tiles myself. What do you think?